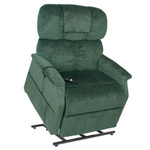 Features Designed for use with a lift chair, standard recliner or couch. Can be used for many activities such as eating, writing, crafts, working on the computer, reading and games. Right or left positioning with 180° rotation so that the chair can be placed by any wall. Table top pivots 360° at the touch of a hand. Teak wood grain laminate finish is attractive, easy to clean and scratch resistant. A built-in magazine rack provides added convenience. Requires no attachment to secure in place. One Year Limited Warranty. 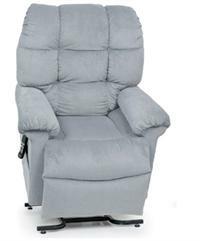 Description This chair table has been designed to complement a lift chair, standard recliner, or couch. The individual can use it for daily activities including eating, writing, crafts, working on the computer, reading, and playing games. The user has the option of right or left positioning in order so that it can be placed by a wall. The chair table can stay in the desired position without attachment, and a built in magazine rack is included for enhanced convenience. 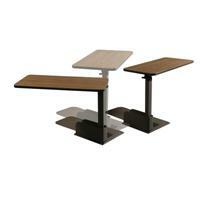 Its teak wood grain laminate finish is shiny, easily maintainable, and scratch resistant. 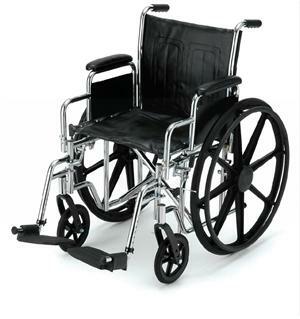 Please note, lift chair for illustration purposes only and is not included. Specifications Overall Width at Base	N/A Overall Depth at Base	N/A Product Weight	39 lbs. Shipping Weight	43 lbs. Tabletop Adjustment (highest)	33" Tabletop Adjustment (lowest)	23.5" Tabletop Surface Depth	15" Tabletop Surface Width	30" Weight Capacity	50 lbs. Warranty	One Year Limited Warranty.